March came in and went out like a lion! The month of March is in the review and many people are happy about that! We ended up with 19 days below average for day-time highs and 12 days above average for day-time highs. 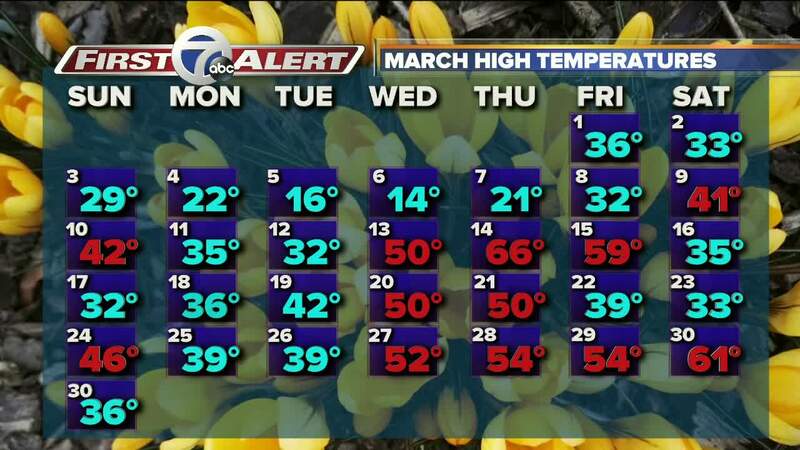 We made it into the 60s only twice (March 14th and March 60th) and spent time in the teens just as long ( March 5th and March 6th)! The last weekend of the month was a good spring roller coaster, we spent Saturday the 30th in the 60s and by Sunday we had highs in the 30s and ended up with 2.2 inches of snow on the ground. The month in whole was 2.5 degrees below average, the Buffalo Airport finished at 31.5 degrees, normally we should be at 34F. We stayed out of the top 10 coldest March's on record by over 4 1/2 degrees. As the last bit of snow fell Sunday, March 21st the airport ended up with 10.5" of snow, which is 2.4" below average, typically receiving an average of 12.9" of snow for the month. We were no where near the snowiest or least snowiest March's on record. We would have needed another 14" of snow to be in a tie for 10th place in the snowiest category or would need to knock off nine inches of snow to get into the 10th spot of least snowiest. A combination of snow/rain (& water equivalent) March 2019 goes down as receiving 95% of average precipitation.